La civilisation, c'est l'art de se créer des besoins inutiles. 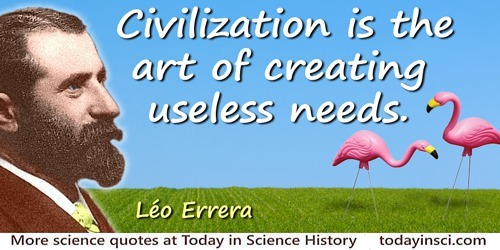 Civilization is the art of creating useless needs. As useless as a screen door on a submarine. In use as early as 1963, for example, “the boy indulging in horseplay is about as funny as a screen door on a submarine,” in publication Safety Education (Jan 1963), 39. Please contact Webmaster if you know the original source. This is a commonly seen paraphrase from his comment on mechanical brains. Originally quoted as “But they are useless. They can only give you answers,” in interview article by William Fifield, 'Pablo Picasso: A Composite Interview', in The Paris Review 32 (Summer-Fall 1964), 62. Describing the interview, Fifield himself set the context as “enormous new mechanical brains or calculating machines.” (These are now called computers.) Collected in William Fifield, In Search of Genius (1982), 145. As identified on the quoteinvestigator.com website. It is the paraphrase that is now more often seen, in for example, Herman Feshbach, 'Reflections on the Microprocessor Revolution: A Physicist’s Viewpoint', in Bruce M. Adkins (ed. ), Man and Technology (1983), 100. Every common mechanic has something to say in his craft about good and evil, useful and useless, but these practical considerations never enter into the purview of the mathematician. Quoted in Robert Drew Hicks, Stoic and Epicurean (1910), 210. From an entertainment point of view, the Solar System has been a bust. None of the planets turns out to have any real-estate potential, and most of them are probably even useless for filming Dune sequels. Human behaviour reveals uniformities which constitute natural laws. If these uniformities did not exist, then there would be neither social science nor political economy, and even the study of history would largely be useless. In effect, if the future actions of men having nothing in common with their past actions, our knowledge of them, although possibly satisfying our curiosity by way of an interesting story, would be entirely useless to us as a guide in life. In Cours d’Economie Politique (1896-7), Vol. 2, 397. I happen to be a kind of monkey. I have a monkeylike curiosity that makes me want to feel, smell, and taste things which arouse my curiosity, then to take them apart. It was born in me. Not everybody is like that, but a scientific researchist should be. Any fool can show me an experiment is useless. I want a man who will try it and get something out of it. Quoted in Guy Suits, ''Willis Rodney Whitney', National Academy of Sciences, Biographical Memoirs (1960), 357. In physiology, as in all other sciences, no discovery is useless, no curiosity misplaced or too ambitious, and we may be certain that every advance achieved in the quest of pure knowledge will sooner or later play its part in the service of man. The Linacre Lecture on the Law of the Heart (1918), 147. In farewell address, Johns Hopkins University, 'The Fixed Period', as quoted in Harvey Cushing, The Life of Sir William Osier (1925), vol. 1, 666. He was reflecting on his own intention to retire (now age 55) because he felt a teacher should have a fixed period of service. The title of his address was from an Anthony Trollope novel The Fixed Period which discussed the retiring of college teachers at age 60. Our atom of carbon enters the leaf, colliding with other innumerable (but here useless) molecules of nitrogen and oxygen. It adheres to a large and complicated molecule that activates it, and simultaneously receives the decisive message from the sky, in the flashing form of a packet of solar light; in an instant, like an insect caught by a spider, it is separated from its oxygen, combined with hydrogen and (one thinks) phosphous, and finally inserted in a chain, whether long or short does not matter, but it is the chain of life. All this happens swiftly, in silence, at the temperature and pressure of the atmosphere, and gratis: dear colleagues, when we learn to do likewise we will be sicut Deus [like God], and we will have also solved the problem of hunger in the world. Levi Primo and Raymond Rosenthal (trans. ), The Periodic Table (1975, 1984), 227-228. In this final section of his book, Levi imagines the life of a carbon atom. He calls this his first “literary dream”. It came to him at Auschwitz. Several of my young acquaintances are in their graves who gave promise of making happy and useful citizens and there is no question whatever that cigarettes alone were the cause of their destruction. No boy living would commence the use of cigarettes if he knew what a useless, soulless, worthless thing they would make of him. The acquirements of science may be termed the armour of the mind; but that armour would be worse than useless, that cost us all we had, and left us nothing to defend. In Lacon, Or, Many Things in a Few Words: Addressed to Those who Think (1820), 121. 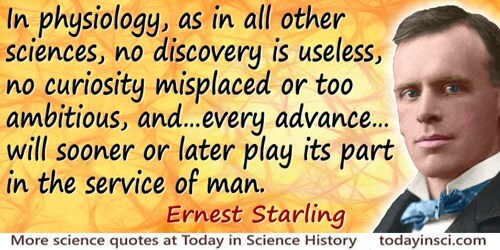 The edifice of science not only requires material, but also a plan. 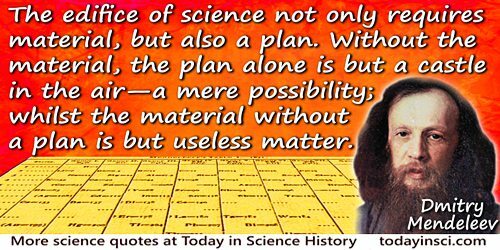 Without the material, the plan alone is but a castle in the air—a mere possibility; whilst the material without a plan is but useless matter. In The Principles of Chemistry (1891), Vol. 1, preface, footnote, ix, as translated from the Russian 5th edition by George Kamensky, edited by A. J. Greenaway. Underneath his sweetness and gentleness was the heat of a volcano. [Michael Faraday] was a man of excitable and fiery nature; but through high self-discipline he had converted the fire into a central glow and motive power of life, instead of permitting it to waste itself in useless passion. In Faraday as a Discoverer (1868), 37.